It was a late night at work and by the time I got home, I was too tired to really make anything for dinner. I'm sure I'm not alone having nights like this. And for nights like this, I'm so thankful to have some dinner waiting for me, even if it means putting in a little time beforehand to make it happen. The temperatures have dropped the past few days here in Chicago, making it a perfect night to settle in with a warm, comforting bowl of soup... and that's exactly what I had. French Onion Soup. 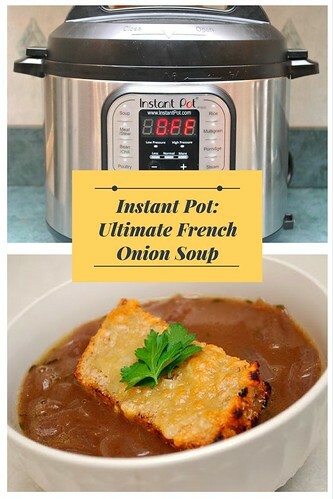 What I love the most about french onion soup is the richness of flavors it has with few ingredients. The soup starts out by sauteing onions until caramelized with a few herbs. Red wine is then added to deglaze the pan and pull up the little bits of goodness that have gathered at the bottom of the pot. The wine eventually reduces and the onions are sprinkled with flour, which will help thicken the soup. Lastly, beef broth is added to provide that meatiness that gives french onion soup that distinct flavor. Of course, we can't forget the infamous topping of a toasted crostini smothered with melted gruyere cheese! Press SAUTE and melt the stick of butter. Add the onions, garlic, bay leaves, thyme, and salt and pepper and cook until the onions are very soft and start to caramelize, about 10 minutes. Dust the onions with the flour and give them a stir. Turn the heat down to medium low so the flour doesn't burn, and cook for 10 minutes to cook out the raw flour taste. Now add the beef broth, bring the soup back to a simmer, and cook for 10 minutes. Season, to taste, with salt and pepper. Meanwhile, preheat the broiler. Arrange the baguette slices on a baking sheet in a single layer. Sprinkle the slices with the Gruyere and broil until bubbly and golden brown, 3 to 5 minutes. Ladle the soup in bowls and float several of the Gruyere croutons on top. Serve hot.